Cell number is one of the most basic and significant metrics for evaluating effects of chemicals on cultured cells. Analyzing factors related to cell number, such as change of cell cycle pattern and apoptosis frequency as well as molecular events, are useful ways to understand the mode of action of chemicals. 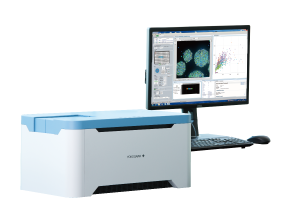 The combination of fluorescently labeling individual phenotype markers and analyzing with the CQ1’s multicolor image acquisition feature enables the collection of multiple streams of quantitative information simultaneously. 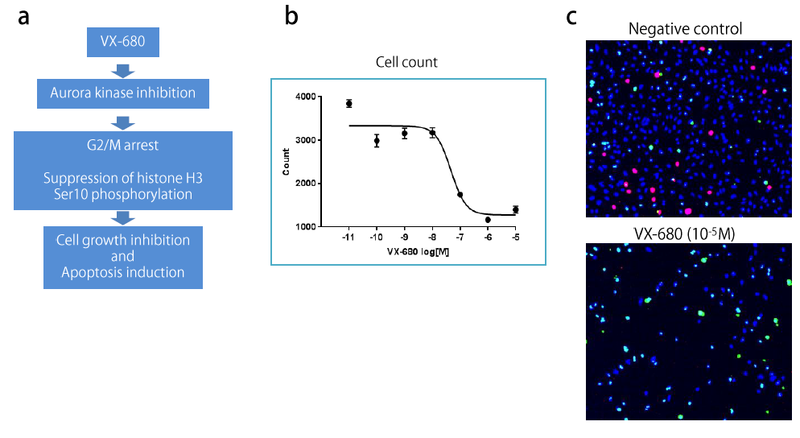 Below we describe a basic example of multi-parameter analysis using HeLa cells treated with an anti-cancer therapeutic agent, VX-680 (Tozasertib). Figure 1. Molecular mode of action of VX-680 and its effect on HeLa cells. b) Dose-response curve of VX-680 vs Cell Count. Error bar: SEM (n=3). c) Multi-color cell images of negative control (upper) and VX-680 treated (lower) wells. Red: Phosphorylated histone H3Ser10 immunostain; Green: caspase-3 active form immunostain; Blue: Druq7 nuclear stain (pseudo color). •HeLa cells were seeded in a 96-well microplate at a density of ２X 104 cells/well. •Serial dilutions of VX-680 were added to the culture (Fig 2) and incubated for 24 h followed by fixation with formaldehyde solution. •Phosphorylated histone H3Ser10 (G2/M progression marker) and active form caspase-3 (apoptosis marker) were fluorescently visualized by double-immunostaining. Cell nuclei were stained with Draq7. •Cell images were captured using the CQ1 with a 4X objective lens and fluorescent excitation by 488/561/640 nm lasers. 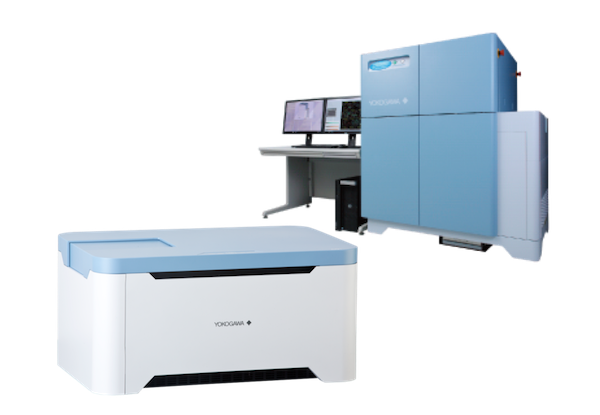 •Acquired digital images were analyzed by the CQ1 software and obtained numerical data were further processed with the FCS Express™ 5 Image Cytometry (De Novo Software, optional) and statistical software. Figure 2. Plate layout for the VX-680 dose-response experiment. 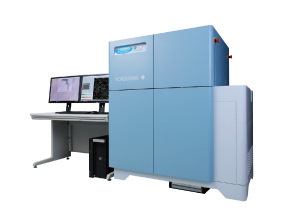 HeLa cells were treated with VX-680 in an increasing dose-dependent manner and multiple parameters related to cell number were analyzed using the CQ1. 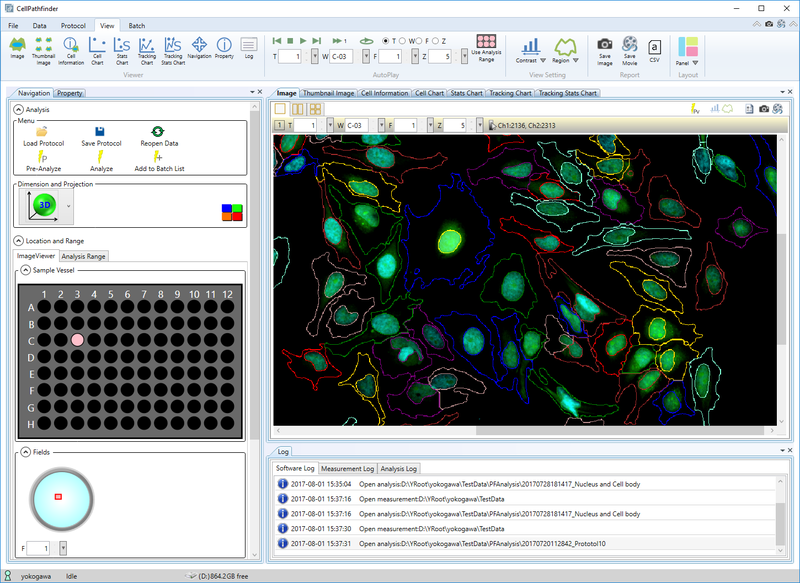 •Cell cycle histograms show 4N cell accumulation indicating cell cycle arrest at G2/M-phase (Fig 3a upper and Fig c). •Scattergram analysis of immunostaining intensities of individual cells show an apparent reduction of H3Ser10 phosphorylation even at low chemical doses (Fig 3a middle and Fig b). •Active form caspase-3 intensities of immunostained cells indicated an increase in apoptosis level (Fig 3a lower and Fig d). •A comparison of these three parameters indicate that the reduction of phosphorylated H3Ser10 started at a low concentration of the chemical. This result implies suppression of Aurora kinasis an early event that triggers cell cycle arrest leading to apoptosis. •In total, these sequential phenomena lead to the reduction of HeLa cell number by VX-680. 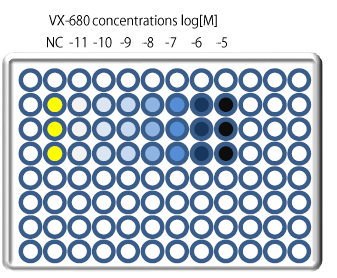 Figure 3 Analysis of three parameters of VX-680 treated HeLa cells. 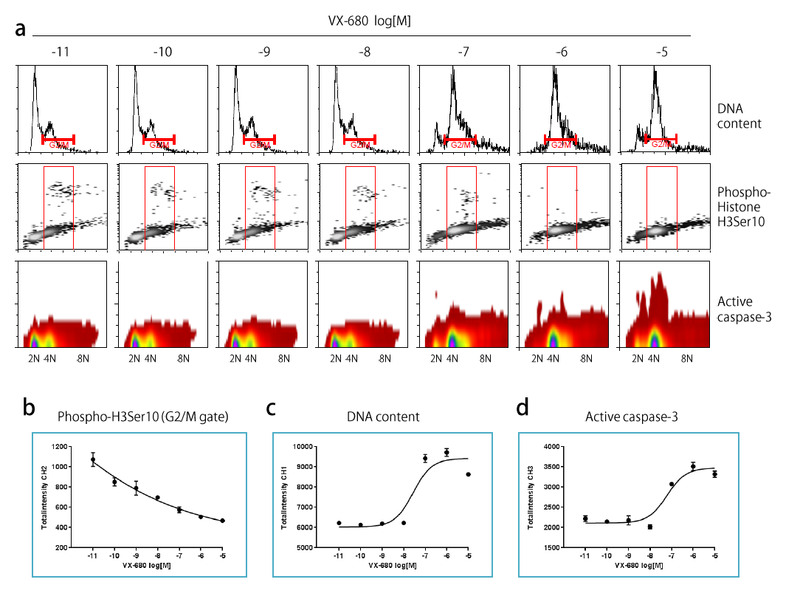 (a) Numerical data of cell measurement was exported from the CQ1, then cell population data was further analyzed by three parameters: DNA content (upper panels), DNA content and phospho-histone H3Ser10 immunostain intensity (middle panels) or DNA content and active caspase-3 immunostaining intensity (lower panels). (b-d) Dose-response curves of phospho-histone H3Ser10 of G2/M gated cell population (b), average DNA content (c) and active caspase-3 from whole cell population (d). Error bar: SEM (n=3).